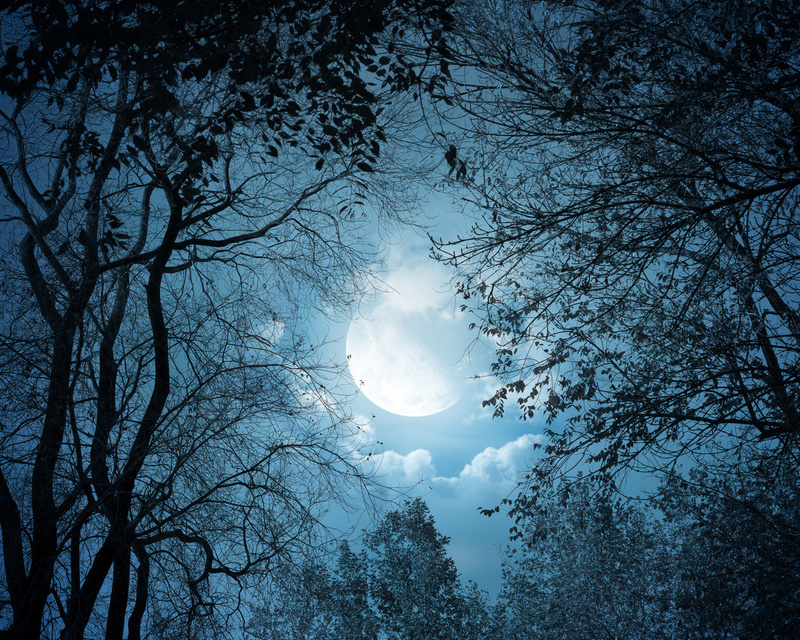 On October 29th at 3:52 pm EDT the full moon occurs in Taurus. This is a time to fully create the balance and structure that is needed for the next level of energies that will be arising on the Earth. It affects us from the peace-loving energy of Taurus as we are in the energies of Scorpio which can be emotional and highly electrifying. It can be a very passionate and exciting time but it also will teach us to be more careful in our dealings. This is also preparing us for the upcoming energies within the month of November with a Solar Eclipse on November 13th-14th and a Lunar Eclipse on the next full moon of November 28th visible in the southern hemisphere. Weather conditions this week are causing disruption around the globe especially in the U.S. East Coast where the hurricane, Sandy, hit the coastline in New Jersey and New York on the 29th. This not only causes physical disruptions but energy patterns with the winds and rain continually for many hours. There have also been disruptions in the earth with an earthquake in Canada which caused some havoc in Hawaii but it was not as bad as anticipated. In reference to Solar Flares there was a huge CME on October 28th but its target was hurled into space. This week it is very imperative for individuals to find their own inner balance. As has been discussed about the Full Moon energies, there are conflicting energies that are going to be hurled right at everyone’s core essence. So it is essentially important to take full advantage of this full moon to completely release old elements that are cropping up in your awareness whether it be with relationships of a personal nature, family members, friends, or your neighbors. It does not matter who it is going to be as it will appear within your awareness this week. This is not a bad element to have happen as it is only preparing you for more acceleration that is deeply needed for the transitions in December. We know we have discussed previously about the December 12th and 21st activations, but we will not know more until the time grows closer due to how people are interacting within their personal agendas. This is something that is essentially important to realize as we personally cannot move through the changes until the agenda’s of one’s self but be fully open to the public so to speak. In reference to the word “public” we mean that it is necessary to be fully open in all avenues of your existence and this means in all your dealings with others. The old facades need to be broken down so that you can find the TRUE YOU. This is also representative of the weather patterns this week. Each time there is a huge current of frequency that can cause destruction upon this Earth, it is representative of the energies that are housed within that geographic area. The lesser the degree of frequency, the more balanced the outcome will be, and the more intense of the situation and how people react to it, the more destruction that will result. Remember these patterns within the weather are being activated in more ways than one and it is up to each individual to fully accept their Divine Responsibility within their divinity to integrate the challenges with the best of their knowledge. So that brings us back to the present discussion of the SELF. What is happening in your life and how are you handling it? Are you taking care of the issues by taking care of elements within your Being. Remember you are the creation of your reality, and these energies are mirrors for each of you. This week is an opportune time to fully acknowledge the parts of your Being that need to be recognized. Are you taking time to accept your gifts and what you are doing within the world? This is where the energy needs to start. Then you can look at what needs to be removed. There are many more elements that you are going to attract in your life when you realize the potential that you have within yourself, but you must start with the best parts of what you know works for you. Sometimes, individuals learn to release what does not serve them, but they really do not accept their true potential. In learning the structure of what works within your circumstance, then you can weed out the parts that are not in full alignment with the basis of the matter. Once you learn to do this with everything you are encountering within your life, you will see a huge change in your reality. We have given you Steps 1, of accepting what you know, 2, letting go of the elements that do not fit into alignment with the first step, and now, 3, moving into a new aspect of your-self. First, when you acquire the first two elements, there is a clearing and a focus than can happen. You may feel renewed and rejuvenated. Allow that feeling to flow within you. Then, it is time to take some steps into a new way of doing or creating. You may feel an inspiration within you that it is time to fully accept your new power. And, you will sense a Beingness within you to fully accept your life is going to change. To continue reading article, please see Walking Terra Christa.com. On Monday, October 29th, 2012 we will experience the next full moon phase which in some readings represents the “Hunter” due to its illuminating light at night. It is the first full moon after the Harvest and the legend was that the light was so bright it was a time for a hunter in native times to walk through the woods and forest to hunt their prey for food. I am in no why aligning my energies with the modern hunter, but showing the history of the times from the past eras when a man needed to gather food for their families which was in balance. What I want to share is how we can take this meaning of the “hunter” to represent what each of us is going through presently in the awakening upon the Earth. We are being honored to have a beautiful moon upon us to help guide us more fully into the night which can represent our darkness. If we can think of ourselves as the “hunter” who has been searching for their pathway of illumination, then search no more. This full moon is going to represent the essences of the higher frequencies of Light to shine within each of us to allow the Light to fully reflect in our lives. It is time ~ to fully understand where we are while allowing the Light of this moon to fully illuminate our full essence in the Now. This moon is also stated to be very powerful as it is in the sign of Taurus. It is a time when we most know what we want, our true desires, so that we can move forward as that is another aspect of the energies presently. Understanding the focus of what we desire and where we are presently will fully allow the doorways to open unto our new reality. The energies presently are going to be coming very swiftly and we can tumble without even knowing what has occurred. It is the perfect opportunity to allow the frequency of Light to fully shine through us from our I AM Presence through the physical reality that is US. We do not have time to waste anymore and those that are newly awakened are going to be needing reassurance that what they are feeling is tried and true in their lives. I will share some personal thoughts on how I am being challenged. I think it helps an individual to realize the potential that lies within them if they hear another’s story from their book. Let’s face it ~ we are in this together. Some of us have been doing it longer than others and that will always be the case. It is the same for the Ascended Masters as we now are becoming the same with them. We learn from each other’s experiences to mold into our own existence. Some of it will help and sometimes it won’t. But it may help to hear from a seasoned lightworker what this frequency is all about. Time is changing quickly. You may have noticed that the hours in your day goes by like a flash, especially if you are doing something that you enjoy. I barely have time to do the personal work like I used to involve myself in for my own pathway upon this Earth. I am finding that the Masters who I work with and love dearly are showing me new ways to create the projects with joy and ease. I ask of you how much time do you spend for yourself? This is something that I was lacking for a couple of months due to the increased energies in Mt. Shasta and in my life. Projects just seemed like they were not getting done but yet the long hours seemed to be the only way I could achieve the results I desired. Until, the Telosian Way of Being Seminar [details available on Walking Terra Christa.com] that we are presenting with Lord Adama, I am learning with my partner, Mike, that even if we have so many deadlines with projects, putting up recordings, sending out newsletters, and sharing as much knowledge as possible, that none of this will matter without our personal pathway. I learned that I needed to do the exercise I desired and not just think about it, but in a very balanced manner. And, if I don’t do a routine three or five times a week, well I am doing it. Balance is the name of the game and without it, everything is going to get lost. When you do this work professionally and within your home environment, these tools are especially important. As always, we always teach what we need the most; and the Ascended Masters remind me of these tools every day to assist my personal well-being upon this planet. The is the reason I sat down in this moment to write about this Full Moon. If you know what you need to do, then slot it into your time management. It works well but only with fluidness. Writing down what you need to do and if you don’t do nit, well, it can be done tomorrow. Having a structure to assist your mental mind and then flowing through it is the best policy that I have created. Some of it is in my thoughts when I awake in the morning. And it has helped me tremendously to feel good about what I am doing, what I am not, and knowing that it is all flowing within my life. It is essential at this point in time as the indication of this full moon is illuminating our essence to allow us to see what our true structure is doing for us. If it is not creating the flow that you need, then change it now. Take the time to remove the old elements to prepare for the new creation that you will be experiencing. This month of November is jam-packed full of frequency updates with the Eclipses both Solar and Lunar. We are being prepared in our sleep-state for the most powerful time in our evolution up to this point for December. So this full moon is going to move us places that we never thought we could be. Put it all into perspective and ready yourself for the ride that you have been asking for. For those that are new to these frequencies, do what works for you, not your best friend. Their energies are probably quite different so create the NEW YOU by intending to be the real YOU. Join us on Monday, October 27th, 2012 for a special Full Moon Ceremony via tele-conference. Details are available on Walking Terra Christa.com. This week we are transitioning the Sun Signs from Libra to Scorpio. Within Libra there is balance or at least we try to create balance in our relationships, environments both personal and work related, and all interactions with others. Moving into Scorpio is the essence of “I Want” which means that we are no longer ready to sit back and accept things for the sake of balance and harmony. This also creates individuals to look more deeply within and get to the ‘heart’ of matters. This can be a very intense time as we switch energies. Let’s look at it as we take the balance of Libra and blend it with the intensity of Scorpio to be the peace-maker but yet not allowing ourselves to be taken advantage of in any situation. We are also preparing for the Full Moon energies on October 29th which is right at the end of this cycle we are speaking about which will be in the sign of Taurus representing “taking care of ourselves”. Take time this week in preparation for this moon cycle as we always have a tendency to feel the energies before each cycle begins. We will be facilitating a Full Moon Ceremony on Walking Terra Christa on Monday evening, 5 PM Pacific. Solar Flare Alert ~ The Earth is being hit with an X-Flare starting on October 23rd which is expected to be felt in Asia and Australia although it may be the result of more solar flares coming which has been the norm in the past few days. So if you are feeling tired, dizzy, irritable, and not just YOU, then you know you are changing through this process of renewal. Take time to rest, take cleansing baths and showers, meditate, and connect with your Highest Presence to assist in the process. The energies this week encompass all that has been written and so much more. Each passing week gives each initiate a perspective of a deeper reality that is currently being presented to them, and we ask you to look at your thoughts and feelings this week. It will serve you on a higher purpose to acknowledge what needs to be looked at to clear and what elements need to be embraced for your higher pathways about to enfold. Each passing moment of this year that is remaining is truly that statement “passing moments”. They are moving quickly with the pace of the clock ticking in the background as each of you are preparing through your Higher Self’s and your physical bodies to be in full alignment. Each moment is crucial to these elements that will occur within your reality. We say these words with great conviction because we want each of you to understand the process of continuance that you are going through to support these moments of change. It is no mistake that you are having fears arise or feelings that you did not think you still had. They are a pure reflection of your energies shifting into the higher essence that you are incorporating within your full body system. We urge you to take these moments and go deeper with each reflection. If something comes up that makes your feel uneasy within yourself, then that is a reflection that you must take time to understand. It is arising for a reason within your consciousness to prepare you for the next step of your evolution. Please know that everything you say and do, how you act, what you are feeling, and experiencing within your life are the mere reflections of what needs to be accepted or removed. You, the maker of your destiny, must make these decisions within yourself in preparation for the next phases that are occurring. In essence this is exactly what you are going through with changes, fluctuations, and energy shifts either through your own inner work or with the assistance of the activations that are occurring within the Earth. Many new individuals are awakening unto these energies which are going to make them feel very uncomfortable within their physical bodies. This past week with 10-21-12 was an Activation Day to assist individuals who need to be awakened more to the reflections within themselves. Many senior members of initiation are beyond these frequencies as they are holding the Light to pass through them unto the Ones that need to accelerate themselves in a new and different way so each of these smaller activations are assisting in the Planetary Awareness of seeing the world in a new and different way. To continue reading this article, see Walking Terra Christa. ©2012 Walking Terra Christa, Rev. Christine Meleriessee & Mike Hayden, Vibrational Ascension Mastery ~ All Rights Reserved. No use without prior written permission allowed except for sharing the link to this page. 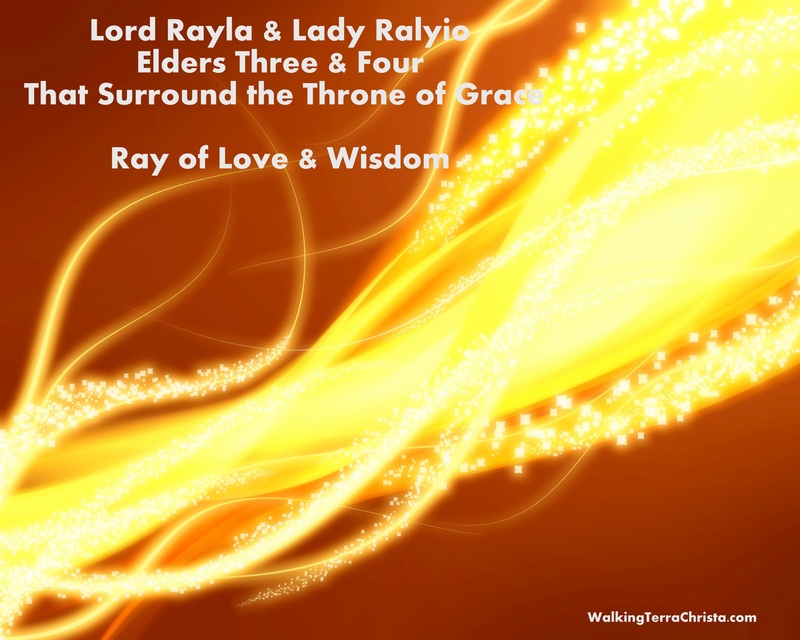 Lord Rayla & Lady Ralyio are the Elders from the Throne of Grace that represent the Golden Yellow Ray of Love and Wisdom. They are considered Elders 3 and 4 in which their essences are a combined effort of many essences of this ray. This is true for all of the Elders, and is a concept that we are not used to understanding; each of us may represent an aspect of them as they sit within the Throne of Grace. Their frequency is one of the purest essence in which we embody. As we sit and call upon the Ray of Love and Wisdom, they will full embody our essence within ours. So the experience can be quite different than receiving the ray energies from the Chohan, Elohim, or Archangels as we probably have more of an affinity with each of those energies. They represent the ability to delve deeper into the soul’s wisdom by accessing patience and strength; thereby, fully embracing the essence of a multi-dimensional Being of Light. We bring to you in this moment the fluidness of the Golden Ray as it is imbued within your own physical body. We want you to acknowledge the frequency of who you are now, and allow this essence to delve deeper into your consciousness of awareness. Accessing the Ray of Love and Wisdom is an acknowledgement of your own essence that will take you on a journey of the Self that is much deeper and creates a beauty of enrichment within your experience. You have arrived with this essence within you but due to the confines of your society and not understand who you are, they have slipped away into the memory banks of your I AM Presence ready to be accessed when your physical existence allows it to be so. Each of you are embodied deeply within Love and Wisdom; it is just what you do with it once it is acknowledged. This is why it is a ray of complete surrender and allowing the essence of expansion to grow within you. Without allowing this to occur, you cannot fully access the Divine Being that you are. It will constrict you and create mental limitations in your daily life. We are here to assist in a new and completely different way than we have ever envisioned before. We are the receptors of the frequency of this ray as we stand proud to embrace each of you into allow the essences that we all represent to fully be accessed within a physical existence. This is very exciting to us, the Elders, that hold this energy deeply. We now have the availablility to fully send the frequency to each of you directly by your command. Once you learn to embody the ray fully within you there is an understanding that is created throughout your mental level. But first, you must realize you are a being of pure love and why shouldn’t you fully allow that to come within your reality. Let’s take a moment and feel this frequency of Light that is truly an aspect within your own essence. We ask you to feel the Universal Love, Patience, and Calmness that results within your Being. We share this with you so as to go deeper into your Heart’s essence which is the Love of God. Feel it flowing within you as it now blends into your Mental essence to relax the mind. You are learning to access the Higher Mind but it does not happen automatically. It must be a fluidness and enveloping energy into your entire system. Once you have acquired this state of Grace, you are now ready to access the Wisdom that is being shared with you. It opens up doorways of the deepest part of your reality within the Cosmic forces. It does not come from your mental mind, but it comes from your Higher Mind. You see these are steps. To read the remainder of this article, please see Walking Terra Christa. Join us for the 22 RAY Challenge which will fully assist you in the pathway of Mastery with ease and grace. ©2012 Walking Terra Christa, Rev. Christine Meleriessee & Mike Hayden, Vibrational Ascension Mastery ~ All Rights Reserved. No use without prior written permission allowed except for sharing the link to this page. Excerpted from the upcoming book. 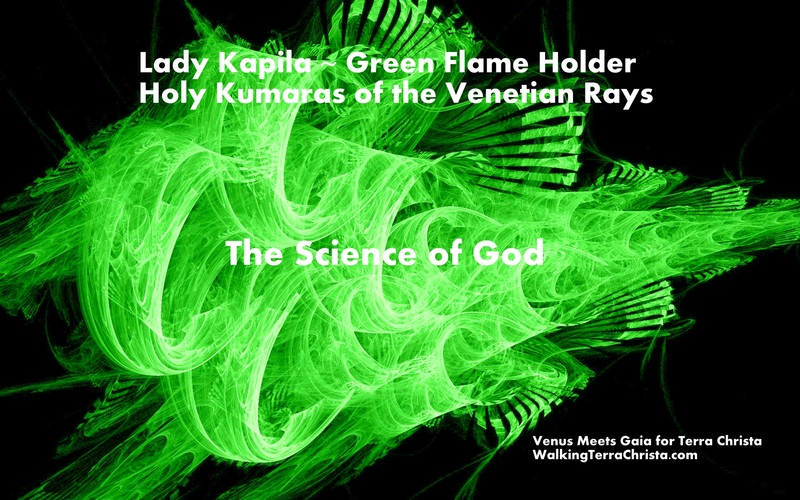 On October 11th, 2012 we were introduced to Lady Kapila, the Green Flame Holder of the Science of God. This is now the 5th flame holder of the Holy Kumaras we have been introduced to for the Venetian Rays of God. The energies of these beautiful beings are truly showing us how to full incorporate the rays in a new and different way of Being. It truly is bringing a balance and frequency that is quite different from the Rays of God as we are teaching presently. This is an on-going program; you can be part of this amazing process with the Holy Kumaras and the Venetian Rays. Details are available on Walking Terra Christa, Venus Meets GAIA for the New Earth. Is One of Great Splendor. Of the Timelines I have forgotten to be put into place. Of the Source of the One. I Allow that frequency to be fully within my physical body. As I create the aspect of my Being. Coming into my Physical Body. As One Source of Being of Light. Lady Kapila comes to us with a balance of the Masculine and Feminine divine within a physical body. Her background is very religious and strict but yet at the end of the transmission, she showed her feminine aspects. She is very, very strong in her beliefs of the Science of God, and is ready to impart to each of us to find our own beginning essence to be fully manifest within our physical body. This should be a very interesting segment as we feel you are going to see a different part of yourself than you currently imagine. I Am Kapila, the Flame Holder of the Science of God. It is a deep honor to have this time with each of you as I share my essence within the Holy Kumaras. The work that I do as a Kumara is taken very seriously as it is a pathway that I did not choose lightly. I am not like the others; I am not a warrior or ever have been. My background includes deep study of the Science of God in many religions. I have worked with some of the very High Priests of Lemuria and Atlantis, one being with Lord Melchizedek. My extensive background includes supporting individuals to understand their own essence of God within them. Sometimes this has not been a very easy task for me to conquer. So I in some sort of understanding I am a warrior but only for the essence of God’s Light and to help others conquer their fears and misconceptions of what that may mean to them. My role as the Flame Holder of the Green Flame is one that I will share with you in depth as we learn from each other. Yes, I will be learning from each of you because, each moment we connect I can see where there may be loop-holes in the continuity of allowing God’s faith to be in each of you. I say this not as a priest, and command it must be so; I say it to remind myself that living upon the Earth is not an easy task to handle. I commend each of you for awakening yourself to the greater potentials that you do not realize, and that is my challenge and gift to you for this segment of the Holy Kumaras. Sometimes Sanat Kumara laughs with me and says I need to lighten up; so I will ask of each of you to help me with this. Show me your moments of happiness so that I can then see that is the Science of God within you. I have not been in body for over 5,000 years and my post as the flame holder has been for 3,000 of those years. I will tell you that I have great knowledge in how to accomplish the task of the Science of the Venusian Rays. It is not difficult; we just need to assist you to REMEMBER which is the first step in acknowledging your own God Essence Within. My work up to this point has not allowed me much interface with human consciousness so I am very excited to be part of this amazing program. It is very enthralling. I spent many years as a Tibetan Monk and among many sects of religious organizations. It took me some time to understand how those roles assisted me but also defrayed me from my full potentiality if I was to be human once again. Instead, I was given the chance to work with the Kumaras to help integrate these essences. We are not much different than you except that our dimensional consciousness is much higher, and we have not gotten into the mental and emotional issues that you, as humans, seem to take on. I know how hard I had to work to remove those timelines and control mechanisms to be here with the Kumaras. So I am here to assist you with all of this. We will work together to help you find the root cause of why you are doing this program, and how it can best benefit you in your pathway upon the New Earth. The first element that I ask of you is just be yourself, in the joy and expression that you are and we will be able to get to the source of all that does not befit your Highest Purpose. I am of the feminine aspect but do have strong masculine qualities. That is what makes me so very special as I can show others how to fully interact with the qualities of the Science of God through my masculine and feminine traits but yet show the strength that is necessary to acquire a pathway that is fully in balance. My embodiments were more male oriented but yet as a Kumara, I was asked to be the woman. I have learned through this process that I can be both. It is my Divine pleasure to walk with each of you with the Science of God. Allow it to flow and it will enable us to work very well together. We start the week off, Monday, with a New Moon in Libra, 8:03 AM EDT which will represent balance in our relationships. It is also a very good time for creating new projects as the energies are presenting this facet in our earth energies. The buzz words are to create the NEW but within the Balance of the Self. This not only represents our relationships but our environment while allowing our new creative Self to be born. 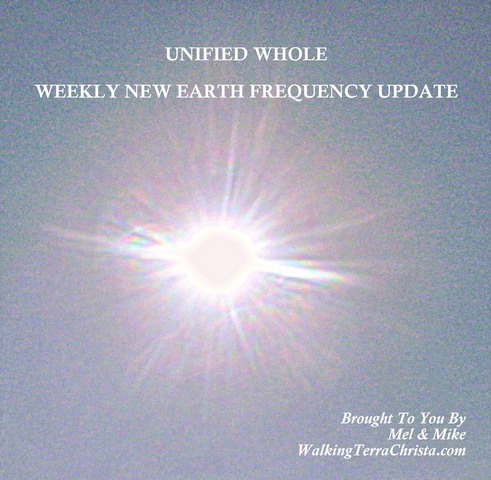 This week will truly help us to embrace the elements that have been purging in the past frequencies recently. So take time to fully understand what is in balance and what is not aligned in your True Self. In reference to Solar Flares it looks like this week is also going to be in balance. There was an ignition of Auroras from a G-1 magnetic storm this past weekend that lasted 15 hours which caused some pretty amazing graphics, see http://spaceweather.com/. The frequency of Light this week is going to be one that will assist you as long as you keep the elements in perspective. Remember that we are preparing for a very important time within two months with the energies of 12-12 and 12-21, 2012. Each of you is being prepared in ways that your Higher Self is deeming it appropriate for your present circumstances. You can no longer accept your life in the way that has always been done. The world is changing into the higher frequencies. Some are living in the 3rd, some in the 4th, and very few in the 5th. But each of us aspires to that point of creation within the 5th dimensional frequency. So each of you must be prepared to step into this doorway of your awakening. We are not talking about new awakenings as in asleep consciousness-minded individuals which there are many of on this planet. We are talking about YOU ~ the one that is reading this text because your life is going to change dramatically in ways behind your conscious reality. This is what we are preparing for in each week and different stages of growth. You may already understand the transition that you are going through but you cannot know, until it arrives, how deeply it will change you. We explain these parts so that you can fully understand the process of each moment you are living within your experiences. This week will help in creating new definitions of the Self within you to fully accept the potentiality that YOU ARE. As we draw closer to these important events, then the understanding will go deeper within you. So this week will help you to realize more of yourself. It is time to fully acknowledge the parts within you that do not fit and allow them to be removed which is not part of the higher aspect of your reality. If you continue to allow yourself to be in the old spaces of existence, then this transition will become ever increasingly difficult for you to handle. It is when you fully allow your physical body to accept the higher frequency that is also YOU, to be within your Being, then you accept the full potential that you are. And that potential will change with each increasing moment of acceptance. Take some moments this week to reflect fully on the inner parts of yourself that need to be adjusted and this may include family and friends that have been dear to your Heart. As you get closer to the inner reality that is you, then you see the perspective changes that need to be made. This is not easy at all but this New Moon represents Balance in all aspects of living and Being. You must be very TRUE to YOURSELF, and in order to do so, you must understand what does not fit your present purpose of existence. We did not say this was easy at all; but each of you that are reading this material, are aligned with a higher consciousness. It depends upon what you do with it and how you allow it to blend within yourself. Please know that awakening of the Soul within the Physical existence is not an easy process as you have been asleep a very long time. You must also know that very careful steps must be taken in order not to perceive yourself as something you are not. This is the paradigm of the New World that will take effect upon everyone’s existence within them and around their environment. It is an essential part of allowing the elements to fully grow within you, adjust the changes that are necessary, and full align with the NEW YOU. So take your time this week in allowing these energies of the New Moon to support your in your own endeavors of creation. It is a very powerful time, and we must not resist what needs to change, walk into new doorways of Light, and accept that you will be supported, loved, and accepted in so many ways. It is our Divine Pleasure to walk with you during this phase and moving into the New Earth of Unified Consciousness. ©2012 Walking Terra Christa, Rev. Christine Meleriessee & Mike Hayden, Vibrational Ascension Mastery ~ All Rights Reserved. Permission granted to share information as long as copyright information is included. The Ray of Love and Wisdom is a very special ray to full learn to intuit. It brings us a softer approach of accessing our wisdom through the essence of pure love. On the Planetary Level it represents the color of Blue within the Heart. This may seem like it is easier to reflect within oneself, because it fully allows the Love essence that is such a deep aspect of our humanness to fully attune within our physicality. The attributes of Love and Wisdom within the Heart are very powerful, but accessing it on a Universal level within the Crown assists us so much more. 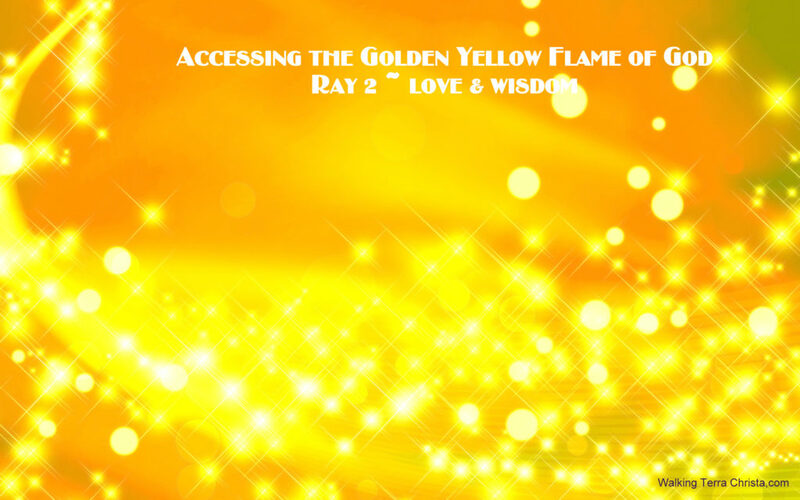 It is the frequency of our spiritual conditioning that flows within us as the Golden Yellow fully reflects this Wisdom of the Love. When an initiate learns to access it within their Crown area, it represents our Higher Self and then our I AM Presence. We can feel love from the Heart but then it is still within the physical aspects of the human body. The essences of this ray are so much more flowing which creates a freedom to access it within the Crown. We are no longer working through the physical Heart of the feelings and emotions but the aspects of our Higher Heart and Higher Mind. This, in turn, activates the Higher Self to be more readily accessible through the physical body. It will help to change elements within the heart area where previously they have been difficult to change. So in essence we are fully accepting our knowledge and truth from our I AM Presence which is truly the God Essence of the Will of God. This allows us, as the initiate, to fully expand all thought processes within the Higher Mind and allows the inner abilities of insight and intuition to flow through us. We are working through Wisdom but access the Love that is personified in the essence of the Divine Mother which will exhibit by being loyal and calm in all our interactions. The rest of the energies just flow through us that can be exhibited as being generous and warm to others. This is just the beginning because as we access each ray we are given opportunities to grow further within our pathways which represent having a Love of the Truth. This takes us on a journey to begin the process of understanding Ascension through the Ascended Masters that have walked before us. It allows us to remove the old timelines when we were not patient and could have become angry at the slightest element when others do not believe as we do. What happens is the essence of our pure heart is fully activated within these energies. The best part of this ray is that there are several Ascended Masters that work within the Ray besides Master Kuthumi and Ascended Master Djwhal Khul. We are honored to work with Lord Maitreya, the Office of the Christ, and Lord Buddha. The Elders from the Throne of Grace who are Lord Ralya & Lady Ralyio bring forth the essence of the ray upon asking for it to be within you. The other beings will full activate it and work with you but the Elders are the ones that initiate the frequencies from the Source of Divine Mother & Father God. A person who has the Ray of Love and Wisdom fully activated within their personality will exhibit these qualities. The will find that they pick careers in the field of Teaching, Healing Writing, Speaking, and wanting to share with others their knowledge from previous timelines. If you would like to know which of the rays you are embodied with, please check out the Ray Reading with Djwhal Khul, Walking Terra Christa. It is a very enlightening experience to understand oneself through the Science of the Rays. In retrospect, if an individual is only acting within the lower aspects of this ray, they may exhibit coldness, indifference to others, and staying strict within their religious beliefs and not connect to the Universal Consciousness we now call Oneness. As in all healing modalities, each of us can aspire to the highest aspects of ourselves and there is always room for growth and potential within each of us. To learn more about the 22 Rays of God, join our 22 RAY Challenge through your email that will allow you to fully understand and incorporate each of these amazing rays of the Spectrum of Light.